The Real Szpilman Revealed by Normand Lebrecht. There is a book to be written about Hollywood's Holocaust silence. For 25 years after the worst crime ever committed, the factories of film ignored the factories of death. War movies poured forth in their hundreds and any British actor who could fake a German accent was assured of a regular income, but the terrible story of genocide was kept off-limits to cinema audiences. You can count the exceptions on the fingers of one hand -The Diary of Anne Frank (1959), Exodus (1960) and the chilling flashbacks in The Pawnbroker (1964) in which Rod Steiger in the name-part is reminded by an indigent black customer of the horrors he escaped. It was network television that broke the silence with the mid-1970s multi part Holocaust serial, in which victims were individualised and given a storyline. Sentimentalised to a fault, the series made more impact on German citizens than any World War II documentary. It also broke the ice for Hollywood to proceed with the likes of Sophie's Choice (1982) and Schindler's List (1993. The problem with these award-laden tear-jerkers, however, is the lack of naturalism. Time lapse may have something to do with it. Forty or fifty years after the events is too late for a director to achieve a simulacrum of contemporaneity. Meryl Streep as Sophie is never wholly credible in Auschwitz stripes. For all the best efforts of make-up and method acting, she remains an American star on an expensive film set. Stephen Spielberg's victims in Schindler's List are several pounds too buxom in the shower, too obviously the products of post-war prosperity. This absence of authenticity is troubling to historians and a boon to Holocaust deniers. Verisimilitude on film cannot be achieved by goodwill and post-dated acts of reparation. What it requires is a survivor's eye - and that's what it gets in The Pianist from the veteran Roman Polanski. The Pianist is not a perfect film. It won the Palme d'Or in Cannes but many critics condemned it as a feeble realisation of the extraordinary book on which it is based - the memoirs of a Jewish pianist, Wladislaw Szpilman, who escaped from the Warsaw Ghetto and survived somehow in a solitaryhiding place. Audiences can now judge the film for themselves, but two aspects struck me as unique, and both relate to the issue of authenticity. The music in the movie is wonderfully true to life - from the very opening shot when the camera pans up the pianist's arm from finger to shoulder, demonstrating that the actor who plays the part can credibly play the piano. Nothing in the musical treatment is contrived, pretentious or remotely precious. It is a rare film, indeed, that treats classical music as an unremarkable part of everyday life. But the triumph of The Pianist is its visual accuracy. Polanski himself survived the war in hiding and his Warsaw backdrops recreate the city as it must have been under Nazi occupation and Soviet siege. After 1945, the Communists rebuilt a capital of tower blocks and tourist kitsch. Tramping its streets while researching my own novel, The Song of Names (Headline, £12.95), I was constantly frustrated by the eradication of atmosphere. Polanski, relying on boyhood memory, revives apartment blocks that feel like prisons and streets on which no-one can be trusted. 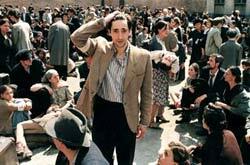 His scenery is the most evocative of any filmic account of the Holocaust, convincing beyond criticism.